Is Thanksgiving crumbling beneath the pressure of Christmas? The evening of Halloween, I walked into Walmart with my 7 year old sister and headed towards the candy aisle. We had run out of candy to hand out and needed to restock. As we walked, she turned her tiny body to me and asked why the stores “totally skipped Thanksgiving.” I had nothing to say; up until then, I hadn’t even noticed. I looked up and realized that the aisles that had been packed to the brim with Halloween candy were now being stocked with Christmas ornaments. 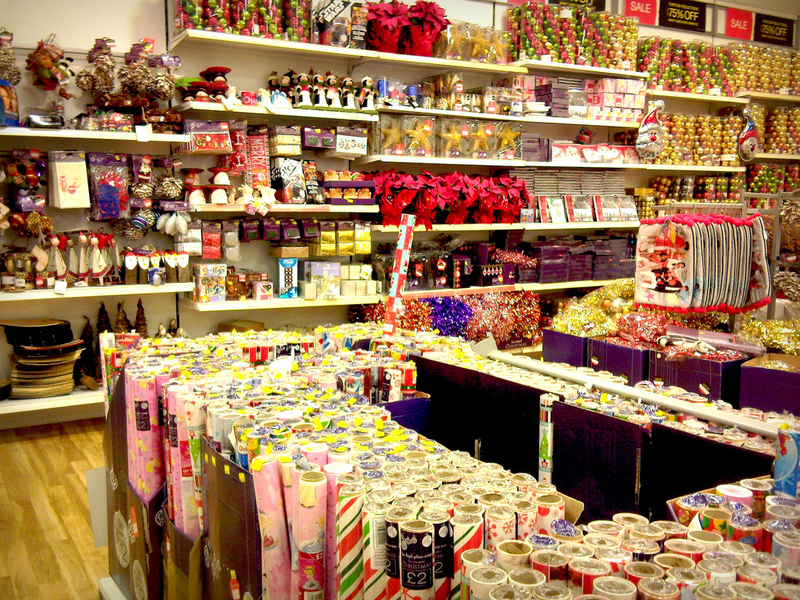 It’s as if the store swallowed all that Halloween candy and vomited red and green gimcrack everywhere. I figured it was normal because stores have been putting Christmas decorations up on the first day of November for years. However, I still tried my very best to think of a good answer for my sister as I found those last couple bags of Halloween candy, purchased them, and left the store. “It must be August, I guess…” from Trevor Coultart on Flickr. I pondered the thought on the drive home. At first I tried to convince myself that stores were simply giving people extra time to start buying Christmas presents for others. That made me feel better about the absence of Thanksgiving, at least for a moment. The stores are just trying to help others have a good Christmas, right? Wrong. The truth hit me like a brick on the head and I realized that stores don’t really care about how your holiday season goes. All they really want is to feel your money piling up in their pockets; and since Thanksgiving doesn’t contribute enough dough to roll in, they jump straight to Christmas. “How much can you buy?” they want to know, “What can we do to make you come back?” They’ve even gone as far as creating a special day specifically dedicated to Christmas shopping. It’s called Black Friday. This day actually wouldn’t be that big of a deal if it really was Black Friday, but it’s actually Black Thursday-and-Friday. The shopping now cuts into Thanksgiving. I shook my head and looked into the rearview mirror. My little sister was sitting quietly in the backseat looking out the window. There was no way I was going to tell her why one of her favorite holidays had been skipped. I wouldn’t be able to even if I tried; I was absolutely speechless. I don’t know when this became acceptable, and when we all allowed it to be. Thanksgiving is a holiday in which we’re all supposed to sit down with our families and be grateful for what we have. I don’t mean to sound cliché, but it’s true. Thanksgiving is the day you should be thankful that you have a car to drive to school, especially when it’s raining. It’s a day to be grateful for those nice clothes and those nice shoes, especially when it’s freezing outside. It is a time to be thankful for the opportunity you’ve been given to spend quality time with your family without being bothered by daily chaos. But we don’t do that anymore. Instead, we’re slowly allowing Thanksgiving to disappear into thin air. We do this by conforming to the corporation’s agenda. When the Christmas gear breaks out for the season, we rush to buy the latest and greatest gadget because we can’t wait any longer. We fear that we’ll miss the best deals and so we buy things now instead of later, despite the hundreds of sales we know are approaching in the near future. We do all of this when Black Friday rolls around and ultimately agree to sacrifice family time for shopping. It’s as if we have forgotten the true meaning of the holidays all together. Even when it’s finally Christmas time, we are focused on those nicely wrapped packages that are sitting under the tree, instead of our family and our faith. Happy Thanksgiving! Shoppers spend the evening of Thanksgiving prepping for Black Friday sales at Best Buy. Photo from David Haines on Flickr. I hope that this year, unlike years past, we actually appreciate the time we are given to be thankful. I hope that this year, when the holidays roll around, we remember why they exist in the first place. Without my 7 year old sister pointing out the missing Thanksgiving decorations, I don’t know if I would’ve quite remembered myself. So this year instead of shopping on Thanksgiving evening, I am going to stay home and spend some quality time with my family. I hope that others choose to do the same. With how much time work and school consumes, it’s not often that we get the opportunity to do so. Take advantage of the time you’ve been given and appreciate it. If we don’t, Thanksgiving will crumble apart and slip between our fingers like fine sand.